With that out of the way, maybe it’s the custom designed tin foil hat I’m wearing right now, but something seems a little fishy about this announcement. First off, Gameloft’s Twitter is notoriously meticulous when it comes to capitalizing things, even to the point of capitalizing “GALAXY" in “Samsung GALAXY," using all the proper periods in “N.O.V.A." instead of just typing “NOVA" like the rest of the world, and more. 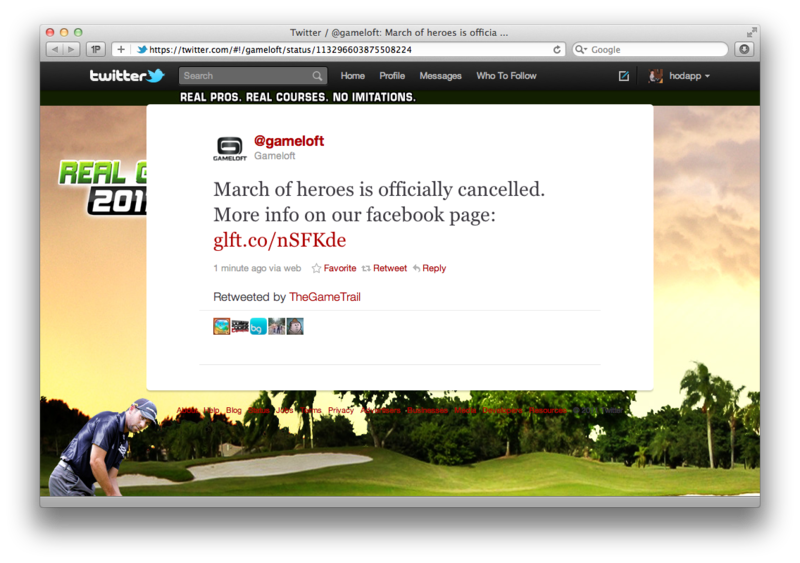 Secondly, the link they’re linking to is just their generic Facebook page which contains no information on the matter. So is this a prank, hoax, publicity stunt, or a little of the three? Who knows. I was looking forward to Gameloft throwing their hat into the proverbial Unreal Engine ring, so this is a bit of a bummer if it’s actually true. Hi everyone, we know we have a big community of FPS fans here… so we are very sorry to announce that we will not be releasing March of Heroes. Our developers will be focusing on developing various awesome games in the months to come and working on making them even better. Fans of March of Heroes should definitely look forward to the powerful Modern Combat 3. We are however, not cancelling our work on the Unreal Engine! We are expecting to release these games starting 2012. So, I suppose, now is the time for rampant speculation as to why it was cancelled instead of just released as-is. The version I saw at E3 seemed very complete. Next PostNext GameStop is Launching Its Own Android-Based Gaming Tablet?